Assisting my medical officer during toilet and suturing of a mixed laceration and abrasion wound over the left eyebrow and deeply contaminated abrasion wound of the left zygoma, I was asked: what do you understand of Plastic surgery? Two days ago was my last day in the rotation. 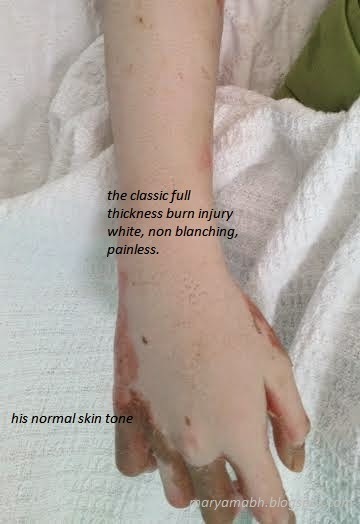 At approximately 1 in the evening, the Burn unit received a young boy with 'second and third degree burn over right upper and lower limb, the back with TBSA of 21%' as they put it. After two weeks in the posting, you'd know in paediatrics population, 21% would require fluid resuscitation. Ok.
A was fifteen, soon to be sitting for exam on the 13th of October. He was the middle child, his sister was married and he got a younger brother who was mentally challenged. The parents were both working that Friday, as were any other days. The moment I laid my eyes upon him, he was shaking and I could not help but think - poor kid, he did not deserve this. He seemed like a clean cut of good kids. Let me make it short by saying on that day, only he and his brother were home. At 10.45 am, he was fixing the two of them breakfast. 'Wanted to fry chicken for me and my brother' said he. As he was frying, he felt giddy (since he had not eaten) and somehow the frying pan slipped, and the oil splashed onto him, right to the limbs and back. He tore his cloth at once and yelled for help. No adults were home, remember? His cry was heard by his cousin who lived next door, and the uncle brought him to a government clinic at 11.15am. 1. Can I just let it out, for the whole 30 minutes nothing was put on his body, no initial burn management? 2. It was boiling oil for gods sake! What to do when you have burn injury? 2. In the mean time, the most important step being, to run the wound area under a running water for at least 20 minutes. RUNNING here was the KEY. Please eradicate from your minds that soy sauce/canned sweetened milk/immersing the wound into a container mixed with salt helped because well they did not. Oh darling you can make a difference. 3. During transport, cover the wound with wet cloths - kind of like wet saline dressing trust me it would hurt less. 1. Be a responsible adult. If you have to be somewhere, at least prepare food for your kids first. 2. Water is magic. Like time, it heals.